Today I am pleased to share a guest post from my friend Matt Wrye who blogs at Beyond Lean. With Matt's 10+ years of lean implementation and problem solving experience, he is able to draw on his successes and failures to tackle new challenges by presenting fresh perspectives and results-driven solutions. Through his exposure to multiple business operation facets in divergent industries that include aluminum, electronics, auto, HVAC, and consumer goods, he is able to provide real-life lean solutions to everyday business challenges. His cornerstone belief is that all levels of the business unit should be educated on lean thinking and principles. To this point, Matt diligently challenges his own lean knowledge while working with all business levels ranging from human resources, accounting and the manufacturing floor to senior managers, executives and presidents. By adhering to this continuous learning philosophy, Matt is able to focus his lean efforts to provide continuous improvement. Matt has a Bachelor of Science degree from Purdue University in Industrial Engineering. Among his other accomplishments, he is a certified Shainin Red X Journeyman and is certified in Statistical analysis and Kepner-Tregoe problem solving methodology. He is proud to have played a large and significant role in starting the Smith County Lean Consortium in Tyler, TX. 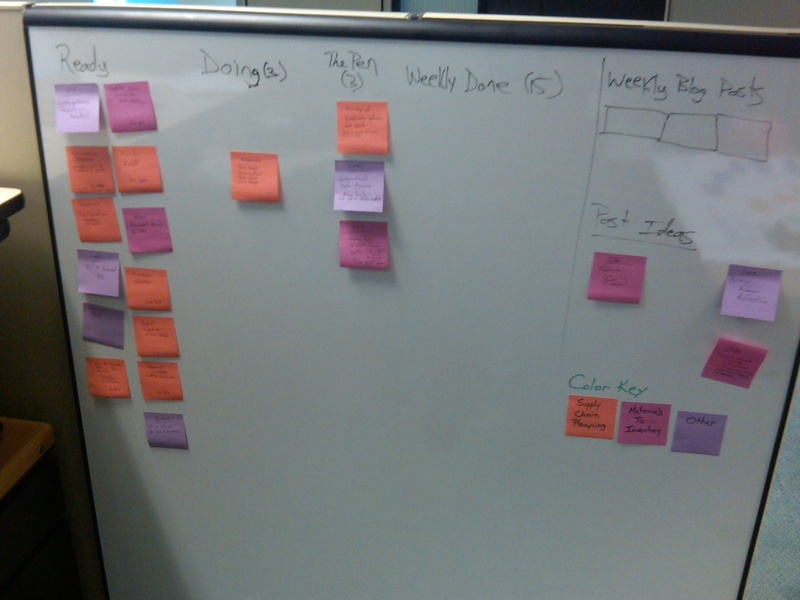 About three months ago, I posted a blog about my first attempt at a personal kanban. It was not successful at all. With some encouragement from fellow blogger Tim McMahon, I reflected more on why it didn't work and then learned more about how to apply personal kanban. "Personal Kanban " by Jim Benson and Tonianne Barry was a helpful resource for me. 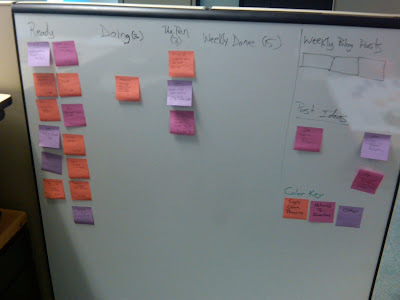 At the end of my previous post, I talked about digitizing my kanban board. I almost fell prey to a common error.....looking for a technology solution when a process has not even been established. I was tempted by the dark side, but resisted. A digital format may be what I need in the future but first I must establish a process that works. The second try at a personal kanban board has been very successful. Here is a picture of my board. It isn't very clear, but I think it will help with the discussion. My value stream is Ready (my queue of work), Doing (what I am working on), Pen (items I have worked on but waiting for input), and Done. I have set my max for Doing and Pen at 3 items. I move items for Ready to Doing after I have moved all items from Doing to Done or Pen. This prevents one thing from sitting in the Doing column for a long time because I move the other two items and avoid the third. Down in the bottom right-hand corner I have a color key. The color of the Post-It notes is related to a specific area of work. Also, I have blog posts that I do weekly. It doesn't matter what day the posts are written but I would like to write 3 a week. It would get monotonous if I used Post-Its for writing three blog posts every week. Instead of using Post-Its, I put up three check boxes. I put a check after in th box after I finish a blog post. The section below it is a place I can put an idea for a blog post. When I want to write a post, I can grab one of the ideas from that section. The board has helped me keep track of my work and made it visual to my boss all that I have going on. It has helped my boss understand where I am spending most of my time. One of the keys is to choose the correct work chunk to put on a Post-It. Too small of a item is a quick to-do. An example of something too small would be to send an email or make a call. Too big of a chunk and nothing will ever move. XYZ Project would be too big. There is a middle ground. Breaking the XYZ Project into smaller chunks has helped me. Create charter for project. Study the current state of the process. Update action item list. These are examples of the middle ground that I have found. I hope this helps others looking at trying a personal kanban. It isn't easy, but when it works it feels good and keeps the work flowing. Now I get to go check a box for blog posts! I have a very similar model that I set up after reading Tim's first post on personal kanban. I used a whiteboard with grids on it. There is "To Do", "On Deck" (six items max), "Today/Now" (3 items max), "Waiting" (similar to your Pending) and "Done". I am around our building a lot and I carry a clipboard with Leader Standard Work on it. The bottom half of the sheet is left blank for notes as I walk around. At dept. meetings, etc. I will write notes w/ideas or action items to work on. Then when I get back to my desk I will either complete the ideas or transfer them to a post it onto my board. Matt-this looks like a good application of personal Kanban. Good job and thanks for sharing.